Below are the best Henderson Nevada hotels that will fit everyone’s budget. 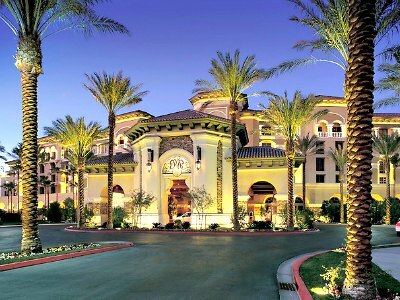 For resort style amenities try the Green Valley Ranch Resort and Spa or the Sunset Station Hotel and Casino. Families looking for all-suite style accommodations should stay at Residence Inn by Marriott Las Vegas/Green Valley, Springhill Suites by Marriott Henderson or Towneplace Suites by Marriott Henderson. Travelers looking for unique properties can book at the Railroad Pass Hotel and Casino, the Skyline Hotel and Casino or the Fiesta Henderson Hotel and Casino. Value properties include the Best Western Plus St. Rose Pkwy/Las Vegas South Hotel, Comfort Inn and Suites Henderson, the Holiday Inn Express Hotel and Suites Henderson and the Courtyard by Marriott Las Vegas Henderson/Green Valley. Budget travelers should stay at the Hampton Inn and Suites Las Vegas – Henderson, Hawthorn Suites by Wyndham Las Vegas/Henderson or Best Western Plus Henderson Hotel. When you are looking for an upper-mid-range Henderson Nevada hotel that offers numerous onsite amenities for families and couples then you should stay at the Green Valley Ranch Resort and Spa. Located west of Henderson along I-215 in the Green Valley South area, the Green Valley Ranch Resort is situated on 8-acres of manicured landscape within 5-miles from the Lion Habitat Ranch and is less than 10-miles from the Strip. The Green Valley Ranch Resort and Spa has a Mediterranean eight floor architectural style with 495 rooms and suites that feature a contemporary European decor. Deluxe rooms have 495 square feet with a choice of bedding and Deluxe balcony rooms are 545 square feet with a private balcony. One-bedroom Executive suites are sized at 715 square feet with a separate parlor area, a choice of bedding and some units feature a private balcony. One-bedroom Grand suites are 1,000 square feet with a separate living room that has a sofa sleeper, dining area, 1.5-bathrooms, dining area and a wet bar. One-bedroom Geneva suites have 2,200 square feet with separate living and dining rooms, 1.5-bathrooms, a grand piano or billiards table and a wet bar. Luxury Patio suites are one-bedroom with 1,500 square feet, a separate living room that includes a dining area, 1.5-bathrooms, a wet bar and a private patio. The Green Valley Ranch Resort and Spa has a great spot for you to begin your adventures of the surrounding area with several major attractions with a short drive that include Wayne Newton’s Casa de Shenandoah, the Henderson Bird Viewing Preserve and Hoover Dam. The Green Valley Ranch Resort and Spa Henderson Nevada hotel has an abundance of onsite amenities that includes a children’s club, the Regal Green Valley Ranch Stadium 10, an arcade room and shopping at the District at Green Valley Ranch. The property has an infinity freshwater swimming pool with a sundeck that offers poolside service, a fitness center and a full service spa. Dining at the resort includes casual dining at the Feast Buffet, Bottiglia, Borracha, Grand Cafe, Turf Grill, Pizza Rock, Tides Seafood and Sushi Bar as well as fine dining at Hank’s Fine Steaks and Martinis and there is a food court with quick bites. Nightlife is packed with live concerts, DJ’s and live music at the Drop Bar as well as Lobby Bar and families will enjoy movies or the arcade room. If you are seeking a mid-range family-friendly Henderson Nevada hotel that has plenty of onsite amenities including a children’s club then the Sunset Station Hotel and Casino is a superb choice. Located northwest of Henderson in the Whitney Ranch area, the Sunset Station Hotel and Casino is situated 1-mile from the Cowabunga Bay Water Park and less than 10-miles away from the Strip. The Sunset Station Hotel and Casino has a modern twenty one story architectural design with 457 rooms as well as suites which have recently been renovated and feature modern chic interior. Deluxe rooms are sized at 300 square feet with a choice of bedding and views of the surrounding area. Petite suites range in size from 360 to 418 square feet with an open floorplan that includes a choice of bedding, a sofa sleeper and views of the Las Vegas Valley. One-bedroom suites have between 925 to 1,025 square feet with a separate living room that has a sofa sleeper, a dining area, a wet bar, Jacuzzi and a views of the valley. 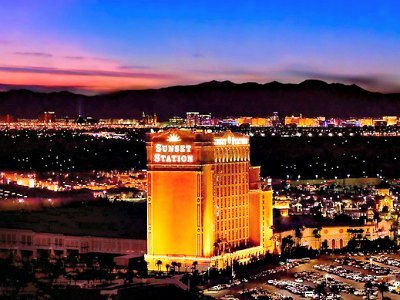 The Sunset Station Hotel and Casino is a perfect place to start your explorations of the area with easy access to Ethel M Chocolates and Cactus Garden, Sunset Park, Hoover Dam and Lake Mead National Recreation Area. The Sunset Station Henderson Nevada Hotel and Casino is packed with amenities that include a children’s club, shopping at the Galleria, an arcade room, the Strike Zone Bowling Alley as well as the Regal Sunset Station Stadium 13 and IMAX. The property has a freshwater swimming pool with a nice sundeck and there is a fitness center. Dining is abundant onsite with the Feast Buffet, Cabo Mexican Restaurant, Pasta Cucina, the Oyster Bar, Viva Salsa, Grand Cafe as well as the Sonoma Cellar Steakhouse and there is a food court with quick bites. Nightlife onsite includes a lively casino floor, the Sunset Amphitheater holds concerts, Club Madrid has live music and there are six bars onsite as well as activities for families from movies to bowling to arcade games. 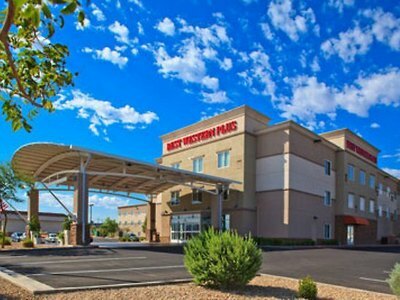 The Best Western Plus Henderson Hotel is a perfect mid-range Henderson Nevada hotel for all types of travelers including families that want easy access to many attractions within the surrounding area. Located north of Henderson on Highway 582, the Best West Western Plus Henderson Hotel is situated 1-mile away from the Henderson Bird Viewing Preserve and is 10-miles from the Strip. The Best Western Plus Henderson Hotel has a modern three floor architectural style with 151 rooms and suites that sport a contemporary decor. All rooms and suites are furnished with a small kitchenette which includes a microwave and refrigerator. Rooms have a choice of bedding and junior suites boast an open floorplan with a sofa sleeper. Premium one-bedroom suites have a separate living room that includes a sofa sleeper. 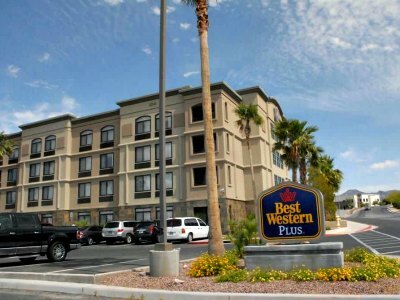 The Best Western Plus Henderson Hotel is a perfect spot to begin your adventures of the surrounding area with several attractions within a short distance that includes the Las Vegas Distillery, the Clark County Heritage Museum, the Nevada Vintage Race Car and Aviation Museum as well as Ethel M Chocolate Factory and Cactus Garden. 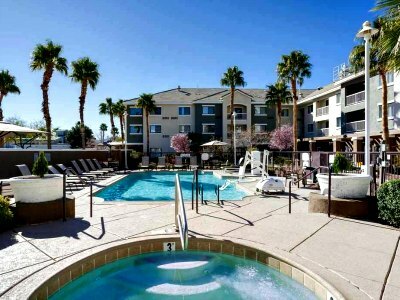 The Best Western Plus Henderson Nevada Hotel has a freshwater swimming with a sundeck and a fitness center. Dining includes a complimentary breakfast daily but there is no restaurant onsite. Dining offsite requires a short drive to Mustang Sally’s Diner, the Greek Bistro and Miller’s Ale House. Nightlife within walking distance includes a cold craft beer at Bad Beat Brewing or the Crafthaus Brewery and there is gambling at the Jokers Wild Casino. When you want to find a mid-range Henderson Nevada hotel that offers plenty of onsite amenities and is close to major attractions then the Fiesta Henderson Hotel and Casino is a perfect selection. Located at the intersection of I-215 and I-515 just 2-miles west of Henderson, the Fiesta Henderson Hotel and Casino is situated 11-miles from the Strip and 5-miles away from the Clark County Wetlands Park. The Fiesta Henderson Hotel and Casino has a modern ten floor architectural style with southwestern ascents that contains 224 rooms which were renovated in 2016 and have a southwestern decor. Rooms range in size from 300 to 312 square feet with a choice of bedding. The Fiesta Henderson Hotel and Casino is within 4-miles to many outstanding attractions such as the Henderson Bird Viewing Preserve, Cowabunga Bay Water Park and you are only 12-miles from Lake Mead National Recreation Area. The Fiesta Henderson Nevada Hotel and Casino has a freshwater swimming pool with a sundeck as well as numerous onsite amenities like a fitness center, arcade, a movie theater and a lively casino. 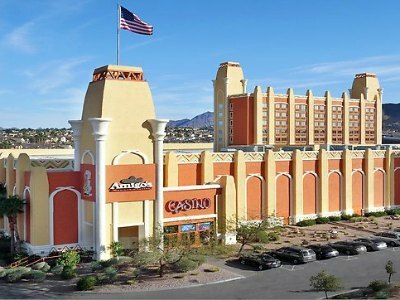 Dining at the Fiesta Henderson Hotel and Casino includes Amigo’s, Fuego, the Festival Buffet and the Cafe Fiesta as well as a food court with quick bites. Offsite dining within an easy drive includes Ventano Italian Grill and Seafood, New York Bistro and Pizza as well as Mustang Sally’s Diner. Nightlife includes gambling at the onsite casino, live entertainment at one of the four 24/7 bars onsite or you can take a short drive to the Lovelady Brewing Company and families will like the Firelight Barn Dinner Theater. 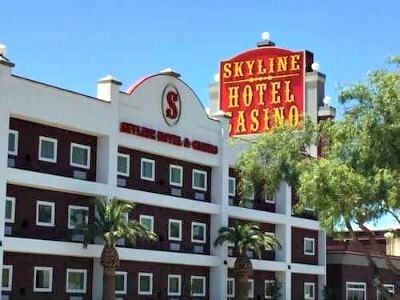 When you are searching for a mid-range Henderson Nevada hotel that is superb for all types of travelers including families and is nearby to many attractions then you should try the Skyline Hotel and Casino. Located north of Henderson along Highway 582, the Skyline Hotel and Casino is situated 5-miles from the Clark County Heritage Museum and 10-miles to the Strip. The Skyline Hotel and Casino has a modern three story architectural design with 51 rooms that feature an Old West interior. Rooms are 320 square feet with a choice of bedding and Executive suites have 360 square feet with a choice of bedding and a fireplace. The Skyline Henderson Nevada hHotel and Casino allows for an easy drive to the Henderson Bird Viewing Preserve, the Clark County Wetlands Park as well as Cowabunga Bay Water Park and you are within a 5-mile drive to Lake Mead National Recreation Area. There is a lively casino and fitness center onsite but no freshwater swimming pool. Dining at the Skyline Hotel and Casino includes all three meals at the Skyline Restaurant and there are several dining options offsite within walking distance that include Penn’s Thai House, Bravo for Italian and Larsen’s Grill prepares steaks. Nightlife includes gambling in the casino and live music at the Skyline Bar on the weekends or you can take a short drive to the Drop Bar as well as the Hi Score Bar Arcade. The Best Western Plus St. Rose Pkwy/Las Vegas south Hotel is a perfect mid-range value choice for a Henderson Nevada hotel which features easy access to many exciting attractions. Located west of Henderson in the Seven Hills area, the Best Western Plus St. Rose Pkwy/Las Vegas South Hotel is situated less than 3-miles to the Lion Habitat Ranch and is 7-miles to the Strip. The Best Western Plus St. Rose Pkwy/Las Vegas South Hotel has a modern four floor architectural style with 99 rooms and suites which sport a contemporary decor. All rooms and suites are furnished with a small kitchenette that includes a microwave and refrigerator. Rooms are 300 square feet with a choice of bedding and some rooms are available with a balcony. One-bedroom suites have 357 square feet with a choice of bedding, separate living area that has a sofa sleeper and a balcony that offers views of the surrounding area including the Strip. The Best Western St. Rose Pkwy/Las Vegas South Hotel is close to many exciting attractions such as Wayne Newton’s Casa de Shenandoah, shopping at the District at Green Valley Ranch and the Silverton Aquarium. The Best Western Plus St. Rose Pkwy/Las Vegas South Henderson Nevada hotel has a freshwater swimming pool and a fitness center. Dining onsite includes a complimentary breakfast but there is no restaurant onsite. Dining offsite within walking distance is plentiful with Big B’s Texas BBQ, Fiesta Filipina Cuisine and I Love Sushi. Nightlife includes a trip to the Strip or you can walk to Kopper Keg St. Rose, the Man Cave Cigar Lounge and Remedy’s Tavern. The Comfort Inn and Suites Henderson is a value oriented mid-range Henderson Nevada hotel that is ideal for budget minded travelers who want access to several attractions. 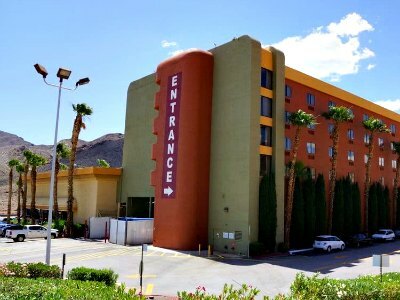 Located northwest of Henderson in the Whitney Ranch area, the Comfort Inn and Suites Henderson is situated adjacent to the Sunset Station Casino and is less than 10-miles from the Strip. The Comfort Inn and Suites Henderson has a modern four story architectural design with 127 rooms and suites that offer a contemporary interior. All rooms and suites are furnished with a small kitchenette which includes a refrigerator and microwave. Rooms have 315 square feet with a choice of bedding and views of the pool are available. Suites are 390 square feet with a privacy wall that separates a living area that has a sofa sleeper, a choice of bedding and views of the pool are available. 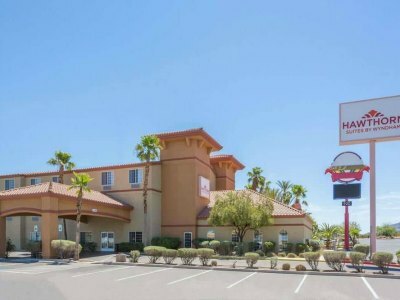 The Comfort Inn and Suites Henderson is a great spot to begin your explorations of the area with a short drive to Cowabunga Bay Water Park and Clark County Heritage Museum as well as a 22-mile drive to Hoover Dam. 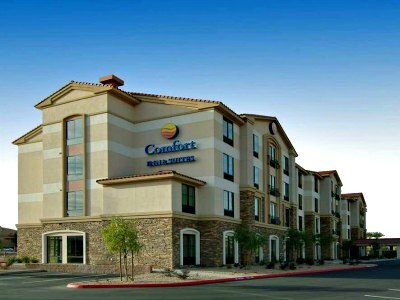 The Comfort Inn and Suites Henderson Nevada hotel has a freshwater swimming pool and a fitness center. Dining includes a complimentary breakfast daily but there is not a restaurant onsite. Offsite dining within walking distance includes PKWY Tavern, the Greek Bistro and Viva Salsa. Nightlife consists of a visit to the Las Vegas Distillery, gambling at the Sunset Station Casino or you can grab a craft beer at Bad Beat Brewing. 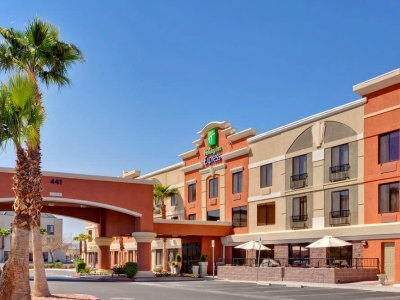 If you are seeking a mid-range value oriented Henderson Nevada hotel that is perfect for families and boasts easy access to many attractions then the Holiday Inn Express Hotel and Suites Henderson is a great selection. Located northwest of Henderson in the Green Valley area, the Holiday Inn Express Hotel and Suites Henderson is situated 6-miles from the Clark County Heritage Museum and less than 9-miles to the Strip. The Holiday Inn Express Hotel and Suites Henderson has a modern three story architectural design with 101 rooms and suites which have a contemporary interior. All rooms and suites are furnished with a small kitchenette that includes a microwave and refrigerator. Rooms have a choice of bedding and Executive rooms are slightly larger with a sitting area. One-bedroom suites range from 350 to 500 square feet with a separate living room that has a sofa sleeper and a choice of bedding. The Holiday Inn Express Hotel and Suites Henderson is close to many nearby attractions that include Cornerstone Park and children will enjoy the Pinball Hall of Fame as well as the King Putt Entertainment Center. The Holiday Inn Express Hotel and Suites Henderson Nevada hotel has a freshwater swimming pool and fitness center but there is no restaurant onsite. Dining includes a complimentary continental breakfast and there are numerous offsite dining choices within walking distance which include the Great Greek, Pasta Cucina as well as Cabo Mexican Restaurant. Nightlife includes a short walk to the Sunset Station Casino or a cold libation at Bad Beat Brewing as well as the Centurion Lounge. When you are looking for a mid-range Henderson Nevada hotel that is superb for families and offers easy access to many attractions then the Courtyard by Marriott Las Vegas Henderson/Green Valley is ideal choice. Located northwest of Henderson in the Green Valley area, the Courtyard by Marriott Las Vegas Henderson/Green Valley is situated within a 20-minute drive of the Strip and is 4-miles away from the Henderson Bird Viewing Preserve. The Courtyard by Marriott Las Vegas Henderson/Green Valley has a modern three floor architectural style with 155 rooms and suites that feature a contemporary decor. Rooms are sized between 331 to 370 square feet with a choice of bedding. Large rooms are 370 square feet with an open floorplan that contains a sofa sleeper, a small kitchenette (microwave and refrigerator) and some units offer a private balcony/patio. One-bedroom suites have 545 square feet with a separate living room that has a sofa sleeper and a small kitchenette. The Courtyard by Marriott Las Vegas Henderson/Green Valley is a perfect place to begin your adventures of the area with attractions like Mystic Falls, Wayne Newton’s Casa de Shenandoah and children will be pleased with the Cowabunga Bay Water Park. The Courtyard by Marriott Henderson Nevada hotel has a freshwater swimming pool with a BBQ area and there is a fitness center onsite. Dining onsite includes the Bistro which is open for breakfast and dinner. Offsite dining within walking distance is plentiful with Thai Chili, Ross J’s Aloha Grill and Weiss Restaurant Deli Bakery. Nightlife can include a 4.5-mile drive to the Hard Rock Cafe Hotel and Casino, the All Family Fun Center or the Double Down Saloon for live music. When you are searching for a mid-range all-suite Henderson Nevada hotel that offers great access to numerous attractions and is family-friendly then you should stay at the Residence Inn by Marriott Las Vegas/Green Valley. 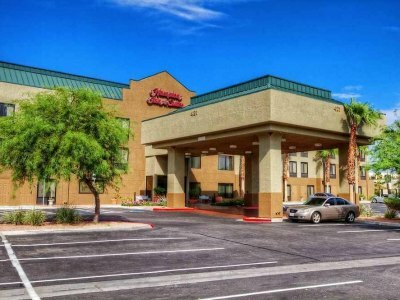 Located northwest of Henderson in the Green Valley area, the Residence Inn by Marriott Las Vegas/Green Valley is situated 4-miles from the Clark County Wetlands Park and 7-miles from the Strip which can be accessed by a complimentary shuttle bus ride. The Residence Inn by Marriott Las Vegas/Green Valley has a modern colonial three story architectural design with 126 suites that boast a contemporary interior. Studios are 425 square feet with an open floorplan that includes a sofa sleeper and full kitchen. One-bedroom suites have 425 square feet with a separate living room that contains a sofa sleeper and a full kitchen. Two-bedroom suites are sized at 825 square feet with a separate living room that has a sofa sleeper, 2-bathrooms and a full kitchen. The Residence Inn by Marriott Las Vegas/Green Valley is an ideal place to start your explorations of the surrounding area with a short drive to Hoover Dam and families can access Kiss Monster Mini Golf, Cowabunga Bay Water Park as well as the Pinball Hall of Fame which are all within 5-miles of the property. The Residence Inn by Marriott Henderson Nevada hotel has a freshwater swimming pool with a sundeck that contains BBQs and there is a fitness center onsite. Dining includes a complimentary breakfast daily as well as a leisurely home cooked meal in your suite and there is complimentary grocery service as well as a manager’s reception Monday thru Wednesday with drinks and appetizers. Dining options offsite within a short walk include Carlito’s Burritos, Todd’s Unique Dining and the Black Bear Diner. Nightlife within walking distance includes Barley’s Casino and Brewing Company and bowling at Wild Fire Lanes or you can take a short drive to Centurion Lounge. 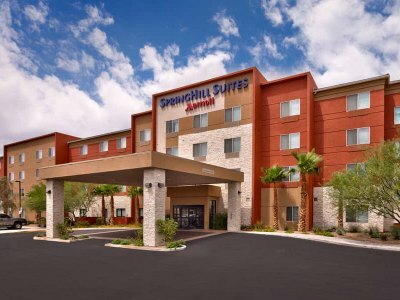 When you want a family-friendly all-suite Henderson Nevada hotel that is close to many of the stellar attractions of the area then the Springhill Suites by Marriott Henderson is a perfect choice. Located west of Henderson in the Green Valley area, the Springhill Suites by Marriott Henderson are situated 6-miles from the Cowabunga Bay Water Park and less than 10-miles away from the Strip. The Springhill Suites by Marriott Henderson have a modern four floor architectural style with 120 suites that feature a contemporary decor. Studio suites have 400 square feet with a choice of bedding as well as a small kitchenette that has a microwave and refrigerator. 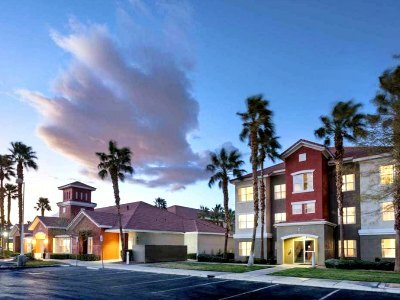 The Springhill Suites by Marriott Henderson has a superb spot to start your explorations of the area with several major attractions within 10-miles such as the District at Green Valley Ranch, the Clark County Heritage Museum and children will like King Putt Entertainment Center which is within walking distance. The Springhill Suites by Marriott Henderson Nevada hotel has an indoor freshwater swimming pool and a fitness center onsite. Dining includes a complimentary breakfast but there is no restaurant at the property. Dining offsite within walking distance includes Ventano Italian Grill and Seafood and within 2-miles you will find Hank’s Fine Steaks and Martinis as well as Lucille’s Smokehouse BBQ. Nightlife within 2-miles includes Timbers Gaming and Pub, Hi Scores Bar-Arcade and you can find gambling at the Green Valley Ranch Resort Casino. When you are searching for a value oriented Henderson Nevada hotel that is family friendly and boasts easy access to many of the surrounding attractions then you should try the Hampton Inn and Suites Las Vegas-Henderson. Located northwest of Henderson adjacent to the Sunset Station Casino, the Hampton Inn and Suites Las Vegas-Henderson are situated 8-miles from the Strip and is a 20-minute drive to Hoover Dam. The Hampton Inn and Suites Las Vegas-Henderson has a modern three story architectural design with 99 rooms and suites that feature a contemporary interior. Rooms are 300 square feet with a choice of bedding. Studios have 500 square feet with a choice of bedding and a small kitchenette that includes a microwave and refrigerator. The Hampton Inn and Suites Las Vegas-Henderson Nevada hotel is close to numerous attractions which include Cowabunga Bay Water Park, the Clark County Wetlands Park and you are 6-miles from the Clark County Heritage Museum. 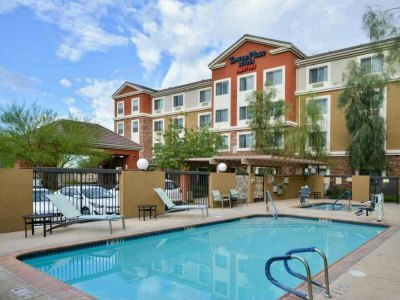 The Hampton Inn and Suites Las Vegas-Henderson has a freshwater swimming pool with a BBQ area and a fitness center. Dining onsite includes a complimentary breakfast daily but there is not a restaurant onsite. Dining options within walking distance include the Great Greek, Pasta Cucina and the Oyster Bar. Nightlife includes gambling at the Sunset Station Casino or a cold libation at Miller’s Ale House as well as a movie at the Regal Sunset Station Stadium 13 and IMAX. When you are seeking a mid-range all-suite Henderson Nevada hotel that is ideal for families searching for more space and a quiet atmosphere then the TownePlace Suites by Marriott Henderson is an ideal selection. Located 2-miles west of downtown Henderson off of I-215, the TownePlace Suites by Marriott Henderson is situated 6-miles from the Clark County Heritage Museum and is 10-miles from the Strip. The TownePlace Suites by Marriott Henderson has a modern four floor architectural style with 108 suites which sport a contemporary decor. All suites have a fully equipped kitchen that includes a dishwasher, microwave, refrigerator and stove. Studios are 400 square feet with an open floorplan that includes a choice of bedding and a sofa sleeper. One-bedroom and two-bedroom suites range in size from 425 to 800 square feet with a separate living room that has a sofa sleeper and a choice of bedding. The TownePlace Suites by Marriott Henderson Nevada hotel has a great spot for exploring the surrounding area with numerous attractions within 5-miles such as Wayne Newton’s Casa de Shenandoah, shopping at the District at Green Valley Ranch and the Sunset Park Disc Golf Course. The property has a freshwater swimming pool with a sundeck that has BBQ grills and a fitness center but there is not a restaurant onsite. Dining includes a complimentary breakfast and a leisurely home cooked meal in your suite. Offsite dining within a short walk includes Metro Pizza, Mi Peru serves Latin dishes and Ventano Italian Grill and Seafood. Nightlife includes several places within a short walk like the Hi Scores Bar-Arcade, the Players Club or you can catch a movie at the Galaxy Theater. If you are looking for a mid-range family friendly historic Henderson Nevada hotel that offers numerous amenities onsite including a casino then you should stay at the Railroad Pass Hotel and Casino. Located 1.5-miles south of Henderson on your way to Boulder City, the Railroad Pass Hotel and Casino was established in 1931 making the property America’s longest running casino and is only 3.5-miles away from the Clark County Heritage Museum. The Railroad Pass Hotel and Casino has a modern four story architectural design with 120 rooms as well as suites that have been recently renovated and boast a modern interior. Standard rooms are 350 square feet with two queen size beds. Deluxe rooms have 500 square feet with a choice of bedding. Large rooms are sized at 650 square feet with an open floorplan that includes a king size bed and sofa sleeper. The Railroad Pass Henderson Nevada hotel and Casino allows for a quick drive to many attractions within 5-miles of the property such as the Bootleg Canyon Mountain Bike Park, the Nevada State Railroad Museum and the Boulder City Hoover Dam Museum. The Railroad Pass Hotel and Casino has a lively casino with numerous gambling options including a sportsbook. The property has a freshwater swimming pool with sundeck but does not offer a fitness center onsite. Dining at the hotel includes all three meals at the 24/7 Iron Rail Cafe, the Box Car Buffet serves lunch as well as dinner and DeSimone’s Steakhouse prepares dinner. Offsite dining requires a short drive where you will find the Southwest Diner, the Coffee Cup and Fox Smokehouse BBQ. Nightlife onsite includes karaoke on Friday nights and live music on Saturday evenings. When you are seeking a value oriented Henderson Nevada hotel that is ideal for families and all travelers then you should try the Hawthorn Suites by Wyndham Las Vegas/Henderson. Located 16-miles from the Strip in Henderson, the Hawthorne Suites by Wyndham Las Vegas/Henderson are situated within 1.5-miles of the Clark County Museum and 11-miles from Boulder City. The Hawthorne Suites by Wyndham Las Vegas/Henderson have a modern two floor architectural style with Spanish colonial ascents and contains 71 rooms as well as suites that feature a contemporary decor. All units are furnished with a small kitchenette which includes a coffee maker, microwave and refrigerator. Rooms are sized at 300 square feet with a variety of bedding choices. Suites have an open floorplan with a sofa sleeper and some units have a full kitchen. The Hawthorne Suites by Wyndham Las Vegas/Henderson is a short drive from many fascinating attractions like Lake Mead, the Lion Habitat Ranch, the Clark County Wetlands Park and you are 4-miles from the Henderson Bird Viewing Preserve. The property has a freshwater swimming pool with courtyard and a fitness center. Dining at the Hawthorne Suites by Wyndham Las Vegas/Henderson Nevada hotel begins with a complimentary breakfast but there is no restaurant onsite. Dining off the property within a short walk includes Johnny Mac’s, the Santa Rosa Taco Shop and the Mad Batter Cafe and Bakery. Nightlife within an easy walk includes the Gold Mine Tavern, Hammer’s Grill for drinks and there is gambling at the Mystic Lodge Casino.